Brett Luke | The Journal Gazette The Swamp Rabbits regroup at their goal after barely stopping the Komets drive during the first period at Memorial Coliseum on Friday night. Brett Luke | The Journal Gazette Jason Binkley of the Komets prepares to take a shot during the first period against the Swamp Rabbits at Memorial Coliseum on Friday night. 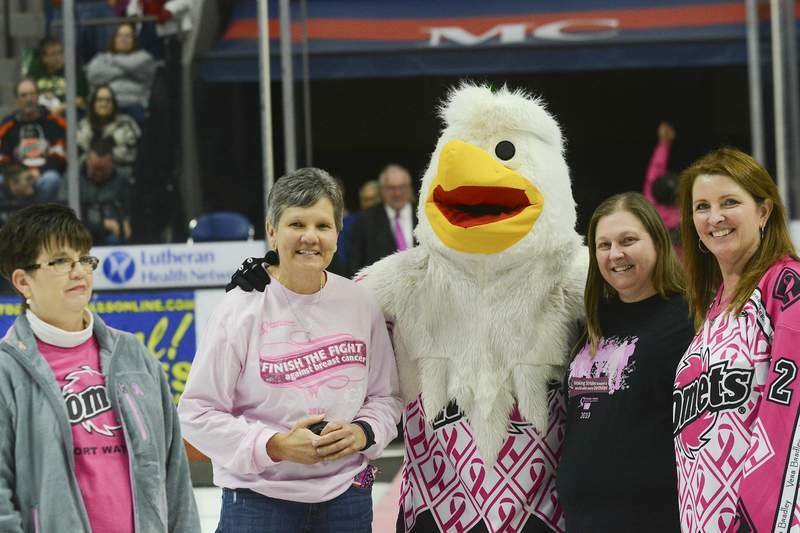 Brett Luke | The Journal Gazette The Komets hosted the first of its “Pink the Rink” nights on Friday at Memorial Coliseum in support of the Vera Bradley Foundation for Breast Cancer Research. Brett Luke | The Journal Gazette Zac Larraza of the Komets taps in a goal against the Swamp Rabbits during the first period at Memorial Coliseum on Friday night. Brett Luke | The Journal Gazette Michael Houser of the Komets catches a shot during the first period against the Swamp Rabbits at Memorial Coliseum on Friday night. 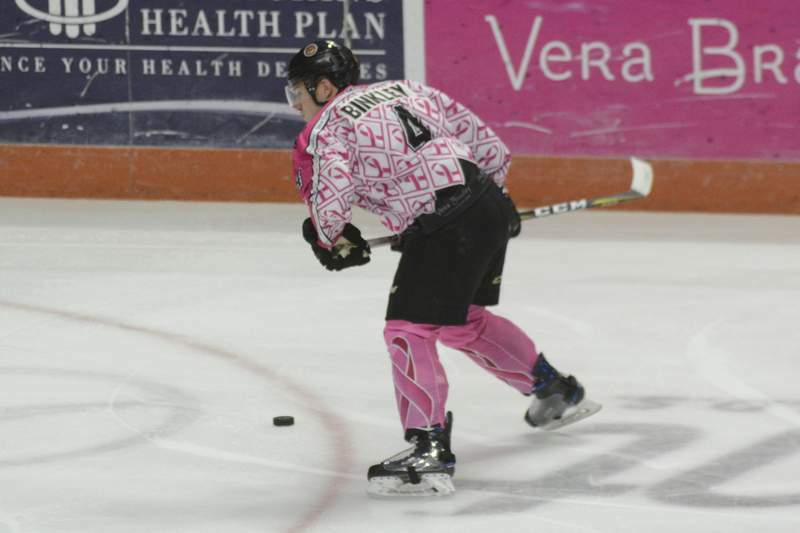 Brett Luke | The Journal Gazette The Komets sport pink jersies in support of “Pink the Rink” night at the Coliseum Friday night. Brett Luke | The Journal Gazette Mason Baptista of the Komets tails closely behind Daniel Echeverri of the Swamp Rabbits during the first period at Memorial Coliseum on Friday night. 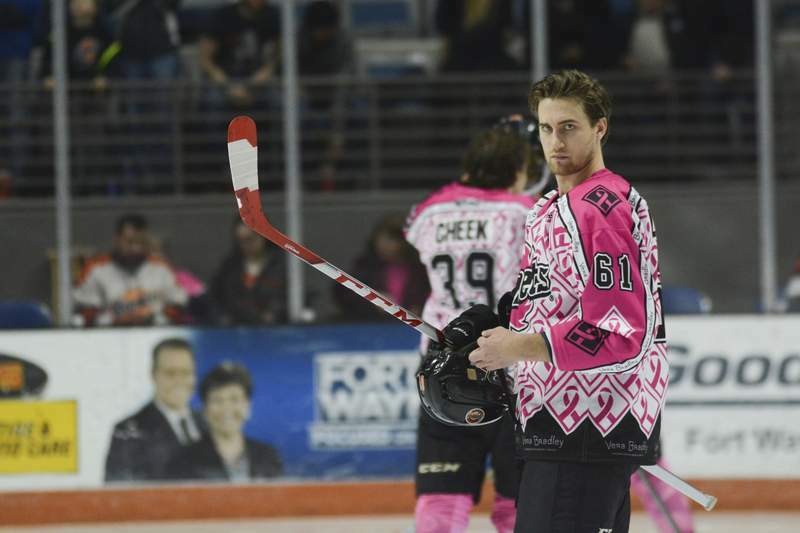 Brett Luke | The Journal Gazette Zac Larraza of the Komets and his teammates sport pink jerseys in support of “Pink the Rink” night at the Coliseum Friday night. 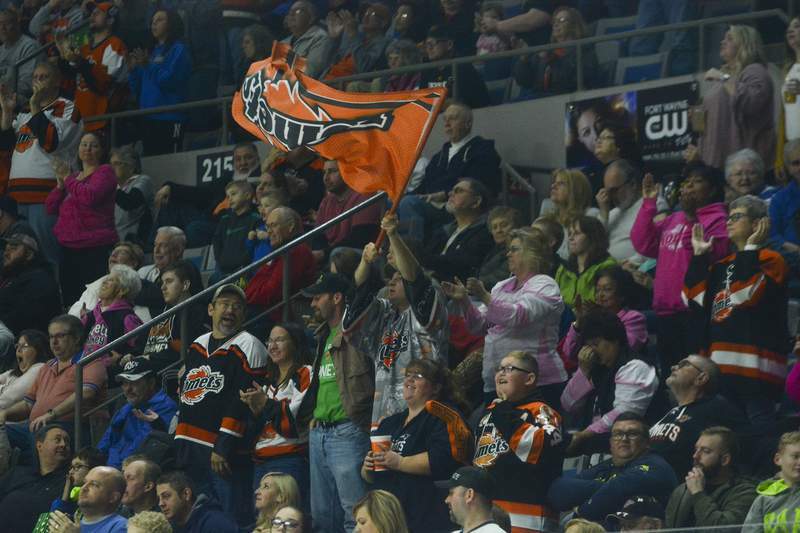 Brett Luke | The Journal Gazette Komet fans celebrate after their second goal during the second period against the Swamp Rabbits at Memorial Coliseum on Friday night. Brett Luke | The Journal Gazette Anthony Cortese prepares to take a shot against the Swamp Rabbits during the second period at Memorial Coliseum on Friday night. It’s tough to say if the Komets were that good in the second period or if the Greenville Swamp Rabbits were that bad. Whichever, the middle period decided the 4-1 Fort Wayne victory Friday. 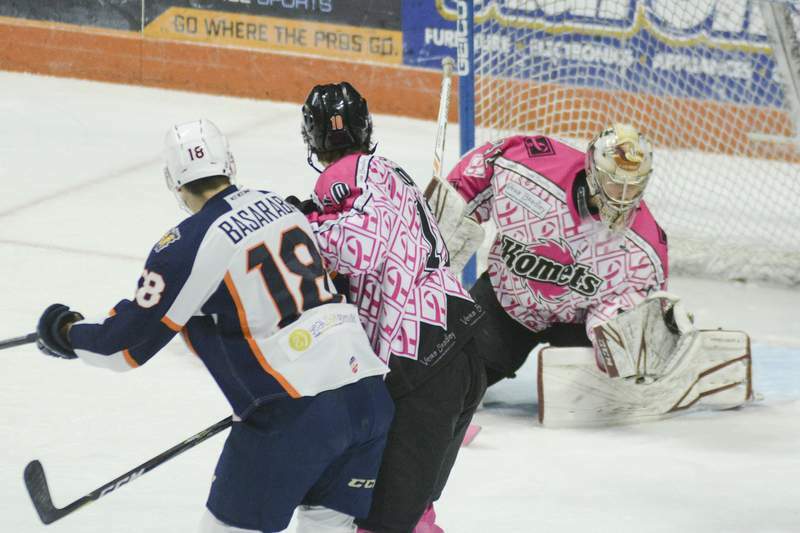 The Komets had the only goals of the period – Shawn Szydlowski and Dennis Kravchenko – and all 21 shots on goal. The closest the Swamp Rabbits came to giving goaltender Michael Houser any work in the period came when Joe Basaraba got the puck 20 feet out, but he whiffed and fell to the ice. That summed up 2018 so far for the Swamp Rabbits, who are coached by Bishop Dwenger graduate Brian Gratz. His team (20-30-4), which has been ravaged by injuries and call-ups, has lost eight in a row and 15 of its last 17 games. 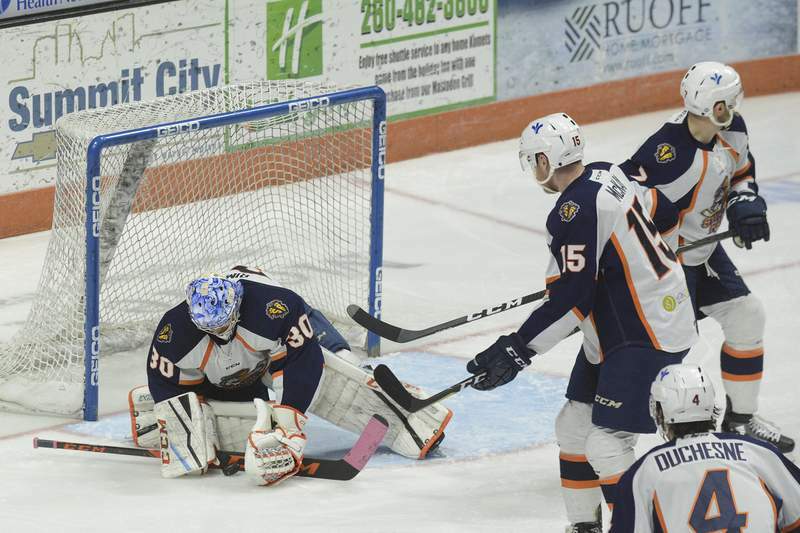 The Komets (36-13-3), meanwhile, are on a 10-0-1 run and have won 15 of their last 17 games, taking control of first place in the Central Division. 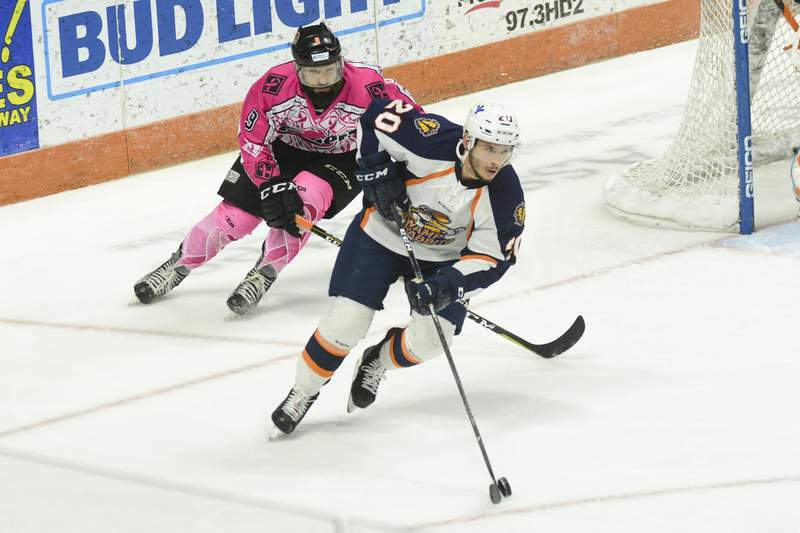 The Komets outshot the Swamp Rabbits 42-15 at Memorial Coliseum, where the teams meet again 7:30 p.m. Saturday. 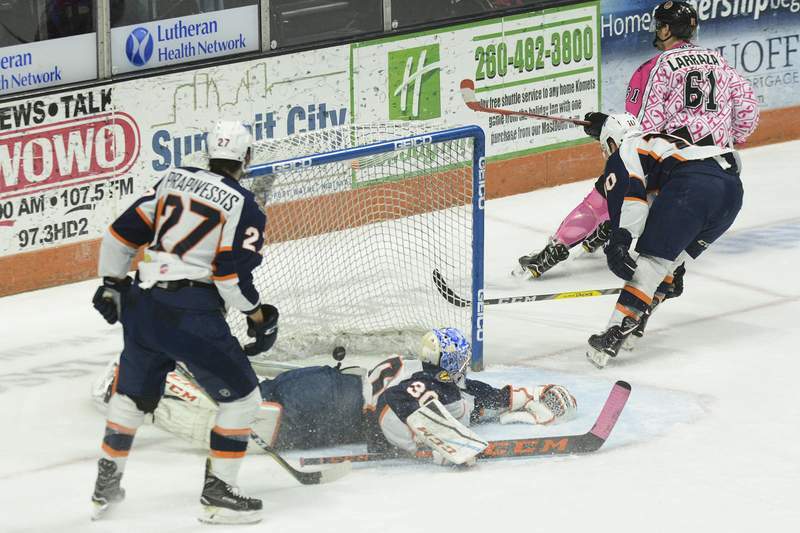 The second period marked the third time in their 66 seasons that the Komets have kept an opponent without a shot on goal. They did it to Peoria in 1990 in the International Hockey League and Quad City in 2006 in the United Hockey League. Greenville was the first team in the ECHL this season to fail to record a shot in a period, though eight times teams had gotten only one shot. It was the first time Gratz and the Komets’ Gary Graham, who played high school hockey for North Side and remain close friends, had faced one another as head coaches. 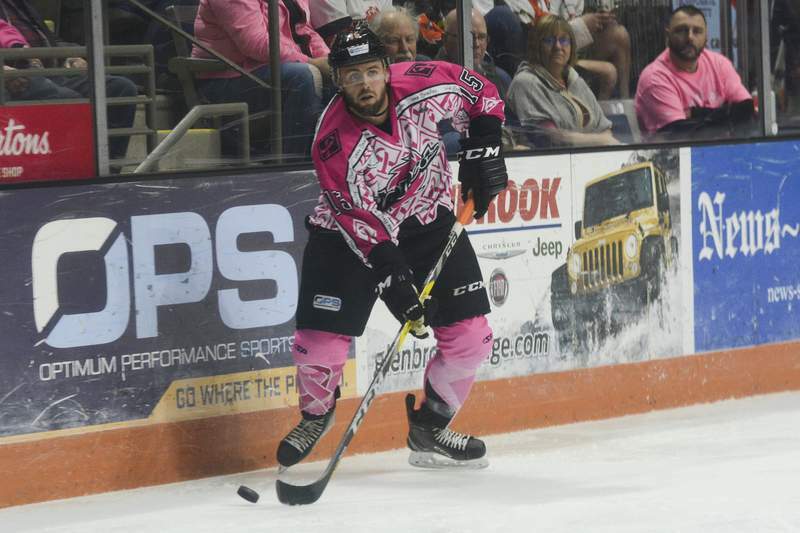 The Komets wore special pink jerseys, which they will wear again Saturday, through their annual “Pink the Rink” partnership with the Vera Bradley Foundation to fight breast cancer. The jerseys are being auctioned off and autographed pucks being sold. They raised $86,000 the previous six years. While the Komets had their newest player, defenseman Anthony Cortese, who was acquired from the Indy Fuel for forward Logan Nelson on Wednesday, they were without captain Jamie Schaafsma (lower body injury), forward Justin Hodgman (bereavement leave) and defenseman Cody Sol (elbow). The Swamp Rabbits actually had the bulk of the early scoring chances, the best one was by the Komets’ Trevor Cheek, who was set up for a one-timer by Artur Tyanulin’s pass from behind the net but stopped by goaltender Ty Rimmer 7:50 into the first period. Cheek atoned, though, at 13:17, at the end of an odd-man rush by eschewing a shot to cut across the slot and send a pass back to Zac Larraza for a shot into an open net and a 1-0 lead. The assist extended Cheek’s point-scoring streak to eight games. The Swamp Rabbits’ Austin McKay answered 1:28 later by redirecting a shot from the blue-line into the net. Szydlowski, who came into the night with a two-point lead over Cincinnati’s Justin Danforth for the ECHL’s point-scoring lead with 61, netted a slapshot from the blue line for a 2-1 lead at 4:25 of the second period. Cortese assisted on the goal.